As mentioned on the general travel page, air travel to the Sunshine Coast is quick and easy and accessible from several locations. There are three small airlines that can bring you here and take you home. Two fly float planes and the third flies a small, 3 passenger, Cessna 172 plane. If person and baggage weighs more than 230 pounds, please let them know as there may be an extra cost. They do not accept golf clubs, bicycles or mega luggage unless you pay for an extra seat. Please note: Fly Coastal only accepts Credit Cards. Cancellations: Please be aware that if you join a flight and cancel - it may affect the other passengers. If you must cancel - 48 hour notice please. Sunshine Coast Air is a float plane service that flies out of Porpoise Bay/Sechelt, at 5987 Sechelt Inlet Rd, Nanaimo Harbour at #7 - 90 Front Street on Nanaimo Harbour across from the Best Western Dorchester Hotel and Vancouver Harbour at Vancouver Harbour Flight Centre, Unit #1 Burrard Landing, 1055 Canada Place. Unfortunately, they no longer provide direct service to Vancouver International Airport, but the Vancouver Harbour Flight Centre is very close to the Canada Line which will take you right out to the Airport in about ½ an hour. Air travel to Vancouver Harbour takes about 15 minutes and is scheduled a couple times a day. Cost is about $89.60 each way and takes about 15 minutes. Sechelt to Nanaimo takes about 15 minutes as well and runs about four times a day. Cost is about $72.00 each way. Children aged 0 to 2 yrs are free, 2 to under 10 are half fare. ID may be required for all guests. Check in is 15 minutes before flight. There is a limit of 25 lbs of luggage per person. A credit card number is required to confirm your reservation. Payment will be processed at the time of the reservation. If Sunshine Coast Air is unable to complete flight service for any reason, alternative methods of transportation may be utilized to complete your travel requirements. These decisions are up to the discretion of Tofino Air management. If Sunshine Coast Air has to cancel your flight due to conditions beyond their control, or is unable to honour your reservation, you will be given a travel voucher to be used on any of our routes within 12 months of the date it is issued. It is strongly recommended to reconfirm your reservation details 24-hours prior to departure. Customers who do not show up for their flight will forfeit the full fare paid. I believe they will take bikes that are broken down and boxed. It looks like they charge $.50/lb. Credit cards are accepted as well as debit and cash. Haroubr Air is the only Sunshine Coast airline that provides air travel to to YVR (Vancouver International Airport) on a regular basis. Most days they have three flights. There are also several flights daily to Nanaimo and Vancouver Harbour. Please check their website for fares and note that some of their flights qualify for SuperSaver Web Fares which are considerably cheaper than regular fares. Booking online is the way to go to save some money. Regular fare is about $79.00 each way. Children aged 0 to 2 yrs are free, 2 to 11 are half fare. Luggage allowance is 25 lbs. Stated luggage allowance includes both checked and carry-on luggage, in addition to sports equipment, strollers, and pet carriers, which are transferred on a space-available basis. Additional luggage (including sports equipment, strollers and pet carriers) may be accommodated on a stand-by basis on the next available flight, subject to weight availability. If you think you will be traveling with more luggage than allotted, please contact the Reservations Department for additional options. Pets must be traveling in a hard-shelled travel carrier. Both travel carrier and the weight of the pet are included in the stated luggage allowance. Carrier must not exceed 15 Inch (38cm) in height and 18 Inch (45cm) in length. I believe they will allow bicycles if they are broken down and boxed. An extra charge may apply. Rental cars can be arranged through Harbour Air when flying to Nanaimo, Vancouver and Sechelt. Click here to return from Air Travel to the Sunshine Coast Home page. 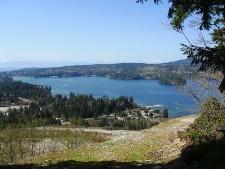 View looking down on Porpoise Bay.